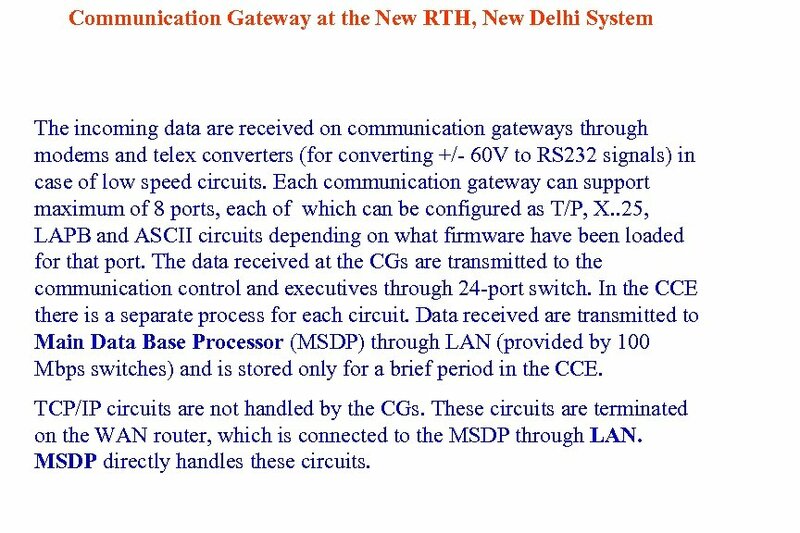 Communication Gateway at the New RTH, New Delhi System The incoming data are received on communication gateways through modems and telex converters (for converting +/- 60 V to RS 232 signals) in case of low speed circuits. Each communication gateway can support maximum of 8 ports, each of which can be configured as T/P, X. . 25, LAPB and ASCII circuits depending on what firmware have been loaded for that port. The data received at the CGs are transmitted to the communication control and executives through 24 -port switch. In the CCE there is a separate process for each circuit. 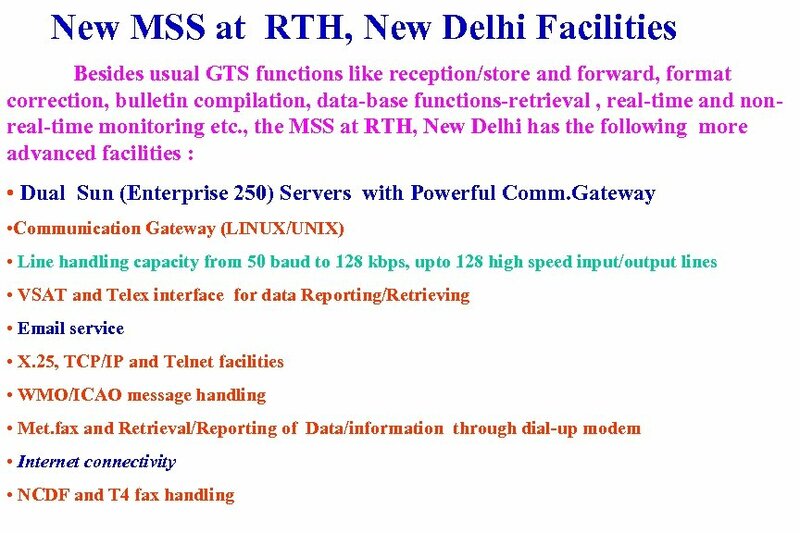 Data received are transmitted to Main Data Base Processor (MSDP) through LAN (provided by 100 Mbps switches) and is stored only for a brief period in the CCE. 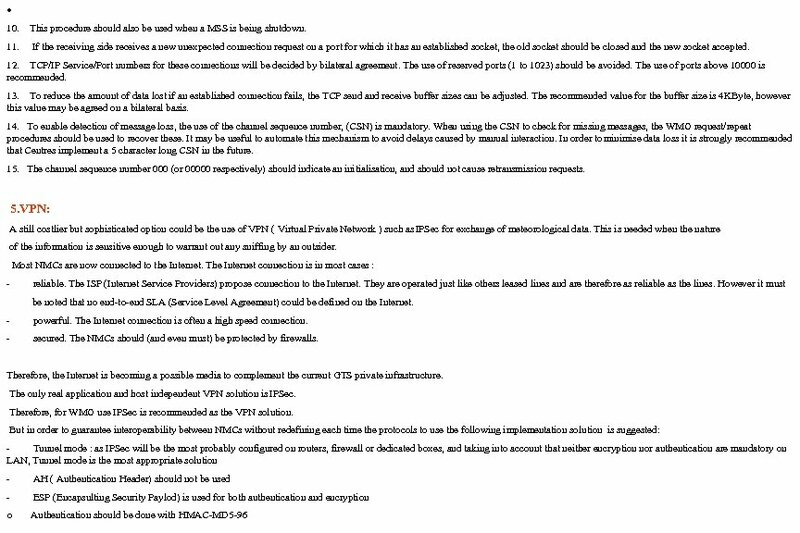 TCP/IP circuits are not handled by the CGs. 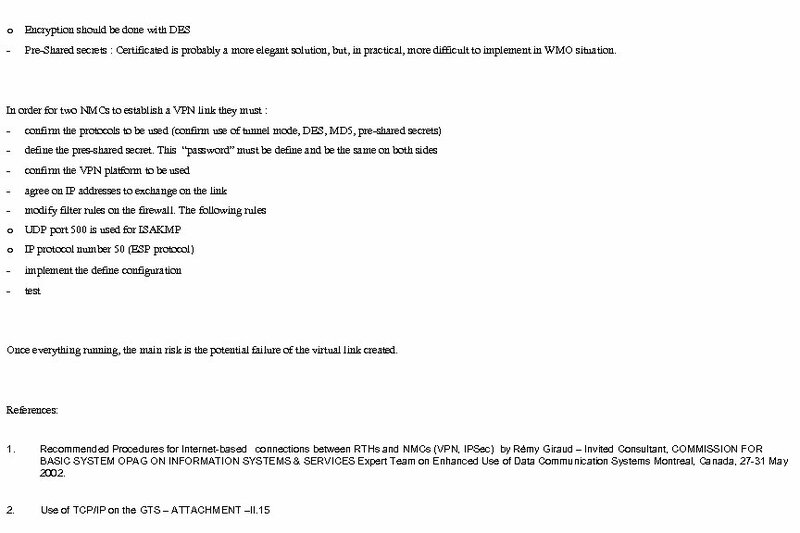 These circuits are terminated on the WAN router, which is connected to the MSDP through LAN. MSDP directly handles these circuits. 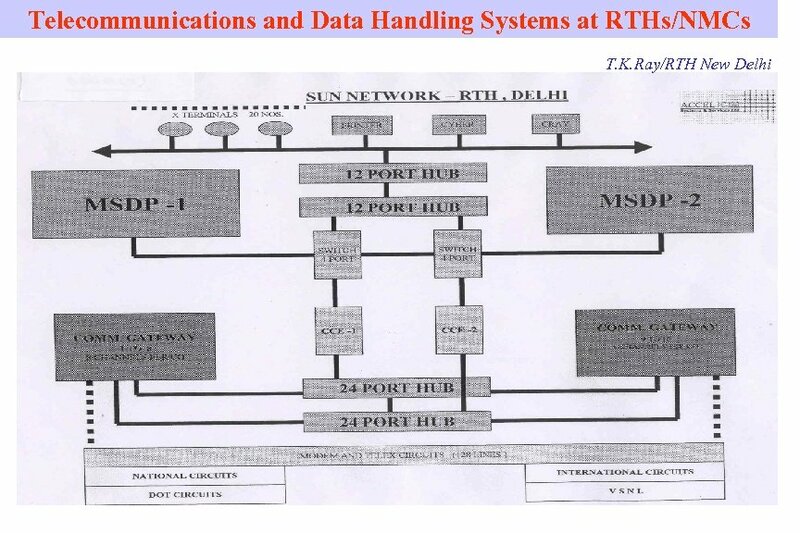 With the advent of Internet and Personal Computers, it is possible today to set up quite a few cost effective yet powerful configurations for exchange of meteorological data between RTH and NMC and between different regions within the NMC as listed below. 1. Email: NMC subscribes to the ISP in its country for a dedicated email account. RTH sends on real time all the GTS messages to this email account. NMC connects to this email account periodically and downloads all the messages for its local use as well as can automatically forward such messages based on predefined message rules to the various regions within the NMC. This arrangement will cost much less as compared to traditional leased T/P circuits. It has the added advantage of the capability to receive binary, fax and graphics files as attachments. It may be noted that in this arrangement there is no custom hardware or software application is required except for some custom facilities at the RTH end. 2. FTP RTH/NMC uses a PC based FTP server to host the GTS messages in predefined message files and authorized centers logs on to this PC to download the files periodically for operational use. The entire procedure can be automated and there is no necessity of any custom application in this set up also. Again this arrangement is also very cost effective. 3. WEBMAIL: Webmail servers such as Microsoft Exchange 2000 based Outlook Web Access ( OWA ) has excellent facility called Public Folder for sharing information between a member who has the write access and others who have the read access. 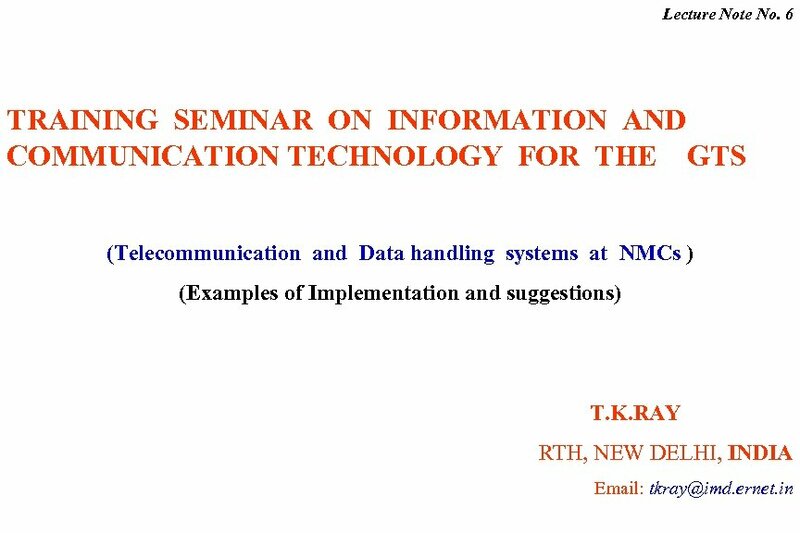 RTH/NMC can publish various processed information such as grid products, analysed charts, satellite and radar imageries for use by the various regional centers. 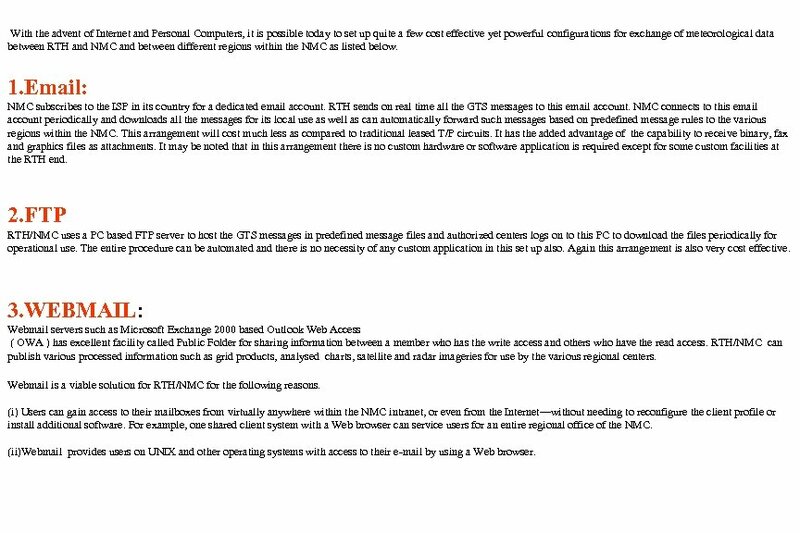 Webmail is a viable solution for RTH/NMC for the following reasons. (i) Users can gain access to their mailboxes from virtually anywhere within the NMC intranet, or even from the Internet—without needing to reconfigure the client profile or install additional software. For example, one shared client system with a Web browser can service users for an entire regional office of the NMC. (ii)Webmail provides users on UNIX and other operating systems with access to their e-mail by using a Web browser. (iii)Deployment of an e-mail client is not required. NMC can support regional offices without needing to deploy the e-mail client on their office system. 4. WMO TCP/IP SOCKET and FTP: 4 All the above facilities are, in addition to, WMO TCP/IP socket procedures and FTP procedures to be implemented using leased data circuits or through internet which need custom application software for setting up exchange of meteorological data. 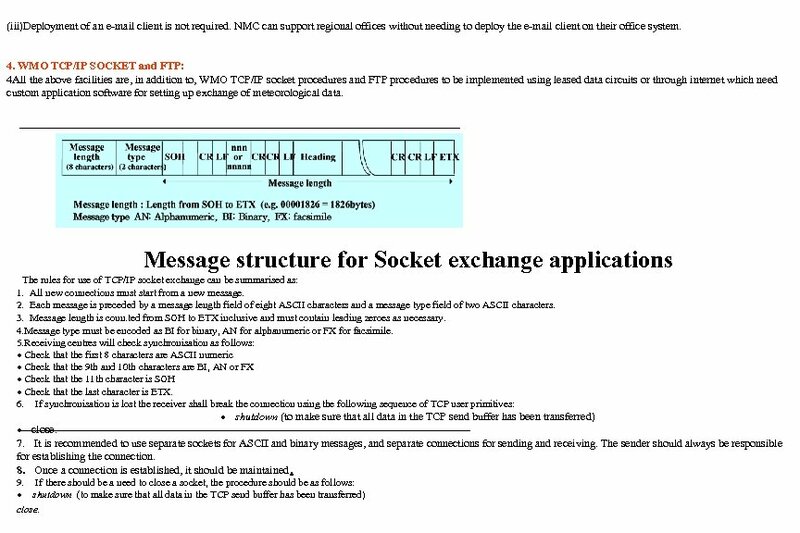 Message structure for Socket exchange applications The rules for use of TCP/IP socket exchange can be summarised as: 1. All new connections must start from a new message. 2. Each message is preceded by a message length field of eight ASCII characters and a message type field of two ASCII characters. 3. Message length is coun. ted from SOH to ETX inclusive and must contain leading zeroes as necessary. 4. Message type must be encoded as BI for binary, AN for alphanumeric or FX for facsimile. 5. Receiving centres will check synchronisation as follows: · Check that the first 8 characters are ASCII numeric · Check that the 9 th and 10 th characters are BI, AN or FX · Check that the 11 th character is SOH · Check that the last character is ETX. 6. If synchronisation is lost the receiver shall break the connection using the following sequence of TCP user primitives: · shutdown (to make sure that all data in the TCP send buffer has been transferred) · close. 7. It is recommended to use separate sockets for ASCII and binary messages, and separate connections for sending and receiving. The sender should always be responsible for establishing the connection. 8. Once a connection is established, it should be maintained. 9. If there should be a need to close a socket, the procedure should be as follows: · shutdown (to make sure that all data in the TCP send buffer has been transferred) close.